Six expert pet-prepping tips to groom your dog for life with an infant. 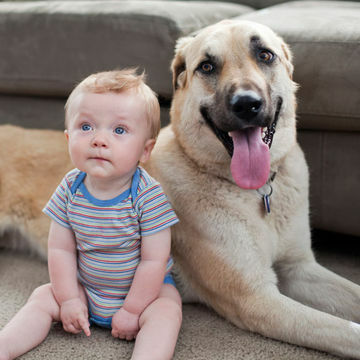 If you already have a four-legged "baby" at home, some good news from Finnish researchers: Infants who are around dogs in their first year of life have fewer respiratory infections, especially ear infections, than those with no animal contact. 1. Cut out rough play. Tug of war and wrestling may be fun for you and your dog, but babies aren't too keen on it. Be aware of how you play with your dog. 2. Simulate life with a baby. Play sounds of infant cries—first softly, then gradually louder. Practice interacting with your dog while holding a doll and create positive associations by rewarding your dog with treats, praise and affection. 3. Consult a professional. If your pet shows any signs of aggression, such as growling when you go near his food, or if you need help curbing other bad behaviors, call a dog trainer. Pedigree counts: Choose someone certified by the Certification Council for Professional Dog Trainers (ccpdt.org). 1. Make an introduction. Let your dog sniff a blanket with your baby's scent before the two meet and, again, create a positive association with simultaneous praise. 2. Schedule doggy-and-me time. Take a walk or visit your favorite dog park. Aim for at least 10 minutes of affection and play with your pet, three times a day. 3. Stay close. Never leave your baby alone with a dog.